A young, vibrant group of up to 20 singers managed by experienced singer/director Karen Gibson, whose credits include backing vocals with such celebrities as Grace Kennedy and The Beautiful South. Kingdom Choir have performed extensively on TV and for many advertisements, corporate launches etc. Matters Musical wish Kingdom Choir a wonderful and memorable day at the wedding on Saturday. The Kingdom Choir is a collective of outstanding singers drawn from various denominations in the South East area of England. 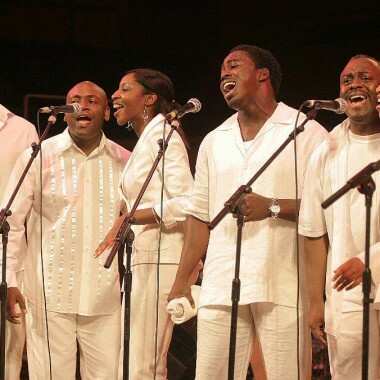 They are a unique group of dedicated men and women, who blend Choral discipline with the raw Gospel spiritual sound – drawn from an inner experience. They have appeared on premier religious radio and television broadcasts such as Songs of Praise, First Light, The Gospel Train, Premier Radio, Sunday Morning Worship on BBC Radio 2. They have also featured in the film ‘Tube Tales’, the TV series Maisie Raine, an Orange advert and on various UK artistes’ recordings and radio broadcasts. In addition, the Kingdom Choir have featured in performances in some of the UK’s most prestigious venues such as the Royal Albert Hall, St Paul’s Cathedral, St Martins in the Field and the Millennium Dome. International travel includes Ireland, Hungary, Switzerland, Italy, Poland and Israel. International artistes that the choir have performed with include Elton John, Luther Vandross, the Spice girls, Michael Ball, Leslie Garrett and Alexander O’Neal as well as Gospel greats Andrae Crouch, Fred Hammond, Donnie McClurkin, Helen Baylor, Alvin Slaughter and Jessy Dixon. Charities with which the Kingdom Choir have been involved include Amnesty International, Bishop Desmond Tutu’s PEN for political prisoners, Jubilee 2000, The Stephen Lawrence Charitable Trust and The Churches Commission for Racial Justice. They have performed for dignitaries such as Nelson Mandela, performing alongside Joan Armatrading singing a tribute song specially penned for Mandela by Joan. The Kingdom Choir also leads successful Gospel Music workshops in schools, universities and church institutions, teaching the history and rudiments of Gospel music. Their aim is to share the joy of singing to as many as possible. The choir achieved national recognition in the Year 2000 by winning BBC Radio 2s Minstrels in the Gallery annual competition. 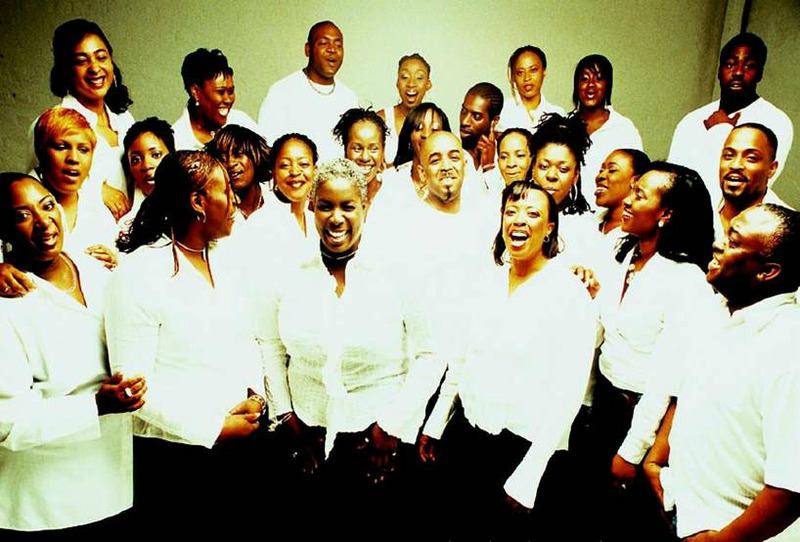 In February 2002, the choir received a nomination in the category of best UK Choir at the Oasis Awards. In May the choir were featured, along with the BBC Philharmonic, in a specially commissioned work, ‘The Hurricane’ for BBC Radio 4’s Easter Sunday Worship. In June, a 200-voice Kingdom Choir featured as the lead choir on the main stage for the processional to celebrate HM Queen Elizabeth’s Golden Jubilee which was televised live in the BBC TV presentation by David Dimbleby. 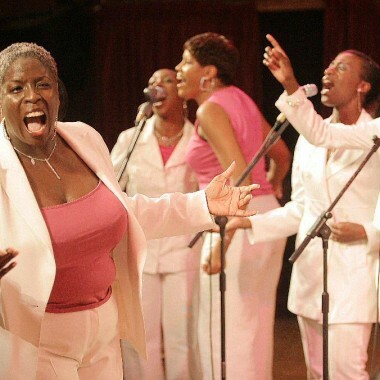 In July 2002 the Kingdom Choir featured at the MRA Arts Renewal Conference in Switzerland, where they were leading Gospel Music workshops and also performing for Swiss National Day. In 2003 the choir, whose members include a number of music educationalists, ran several highly successful school workshops. It also ran major outreach projects in areas such as Hull, Nottingham and Hackney working with young people from disadvantaged backgrounds, an elderly song-writing group and youth offenders who had been referred by social workers. 2004 saw the choir continuing the work in Hackney, but also beginning work in with young people in homes in Lincolnshire. In fact, that was a momentous year for the choir, with the release of their debut album “Smile! It’s a Brand New Day”. The album, a joint project with Christian Aid, centred on ‘Kingdom Praise’ with hope and justice for the poor. The album launch, held at Ocean Music Venue, was an awe-inspiring and first-class performance, with support from UK gospel sensations Four Kornerz and DJ El Niño. The year also saw the choir become winners in the category of Best Choir at the Gem Awards, filmed and televised by BBC1. Since then, the Kingdom Choir has gone from strength to strength and remains one of the most sought after choirs for radio, television, weddings, parties and corporate work.